I will just keep swimming, just keep swimming, just keep swimming, swimming, swimmin. 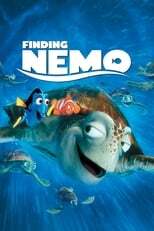 A clown fish named Marlin living in the Great Barrier Reef loses his son, Nemo, after he ventures into the open sea, despite his father's constant warnings about many of the ocean's dangers. Just like previous Pixar films, setting a story under the sea gives them such a massive canvas of characters and set ups to work with, same as they could with toys, bugs and monsters.